(Bloomberg) -- China’s most popular Netflix-like streaming service is angling to build a blockbuster short-video app by 2020, hoping to finally make a splash in an arena crowded with viral phenoms from Bytedance Ltd.’s Douyin to Tencent-backed Kuaishou. IQiyi Inc., controlled by search giant Baidu Inc., intends to cultivate a social media-oriented video sharing platform geared toward entertainment, founder and Chief Executive Officer Gong Yu told Bloomberg Television. That comes after lackluster attempts to crack the genre and could involve fine-tuning an existing app or creating a new one, he added. Apps like Douyin, known as Tik Tok in the U.S., have exploded across China, helping users shoot and share clips on everything from dancing teens and feats of physical strength to noodle-slurping villagers. The video obsession of hundreds of millions has drawn investors and fomented sky-high valuations. But their growing attraction -- particularly among the much-coveted youth demographic -- poses a problem for iQiyi, which competes for user’s time. IQiyi is hoping to tap China’s voracious appetite for everything from celebrity gossip to movie clips -- a function of an exploding film and TV industry that’s also massively inflated production and talent costs. Gong said some of those are coming down in part because of government caps on salaries since 2018, but expenses will keep growing over the longer term as competition for quality content intensifies. Still, its user goal appears modest: leading short-video app Douyin had 426.2 million monthly users as of December, while Kuaishou sported 285 million, according to research house QuestMobile. “We don’t care about short video focusing on news or information, we care about entertainment-related content,” he said. The Baidu Inc. spinoff is one of the largest of a coterie of Netflix- and Hulu-style services, and its closest rivals are backed by internet powerhouses Alibaba Group Holding Ltd. and Tencent Holdings Ltd. -- which also run enormous film production houses. 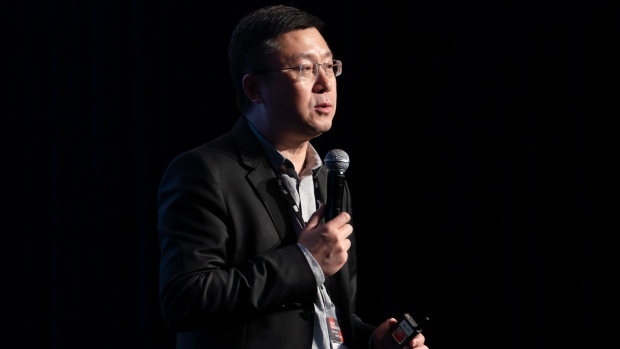 To stay ahead, iQiyi will invest more in original content as well as artificial intelligence to better ply users with recommendations, much as Netflix does, Gong said. It will also explore the use of virtual reality, though that shouldn’t go mainstream for at least three years, he added. IQiyi was China’s largest video streaming site based on time spent, garnering 645 million hours in January, ahead of Tencent and Alibaba’s Youku, according to data compiled by Bloomberg. Its quest for new hits is gaining urgency in part because ad revenue growth has peaked and is beginning to slow, Gong said. Beyond AI and VR, the company is also trying to get game distribution and online reading businesses off the ground. “The advertising business is slowing down, but our paid content business will continue to post strong growth,” he said. Another problem with its core business: the country’s increasingly vibrant entertainment arena remains at the whims of government censors. In one of the better publicized examples, regulators reportedly clamped down on period dramas based on imperial times, because they glorified extravagance and a feudal system abhorred by the Communist Party. Gong said those shows were simply too much alike and their cancellation was intended to make the industry healthier. Since February, every TV series and movie made in China with an investment of as little as 1 million yuan ($149,000) has to submit its title, budget and an outline of its content to regulators before production begins. Once it’s done, all content must be submitted to authorities alongside a breakdown of everything from costs to actors’ salaries. --With assistance from Stephen Engle and David Ramli.